Hey everybody, I’m in San Jose today covering the third trial in Apple v. Samsung to determine how much Samsung owes Apple for infringing 5 design and utility patents for its smartphones. Jury selection is in progress. Stay tuned! FYI – here’s my most recent story on Apple and Samsung’s fight over jury instructions. This case has quite the history, so let me know if you have any questions! Fun pre-trial drama: Someone in the courthouse sent the 74 prospective jurors to the wrong courtroom. Judge Koh is not pleased. Judge Koh just excused a potential juror who’s a Google electrical engineer who works on smartphones. But she declined to excuse another Google employee who’s not an engineer. The court is taking a 10-minute break after excusing a handful of jurors who own Apple shares. INTMT Apple’s stock inches ever closer to hitting the $1 trillion market cap. And Judge Koh refused to excuse a former Apple employee who worked on Apple’s iOS software from 2010 to 2012. He says he can be impartial. Samsung’s atty says they’re fine with it, for now. Funny, this potential juror did not raise his hand when the judge asked the jurors if they have heard anything about Apple v. Samsung. (Apple’s attorney pointed that out.) He’ll be individually questioned about it after lunch. Judge Koh has whittled down the 76 prospective jurors to 36. She asked them if they’ve ever heard anything about a dispute between Apple and Samsung. More than a dozen jurors raised their hands. Judge Koh is questioning prospective jurors individually on what they’ve heard about the Apple v. Samsung. She just excused one juror who said he doesn’t have an opinion about the case, but he generally doesn’t think patents are valid. Court is taking a lunch break. Back in an hour with more voire dire. Doesn’t look likely that we’ll get to opening arguments today. Judge Koh also is keeping a juror – for now – who says she and her husband fight a lot about which smartphone is better. She has an iPhone, her husband has a Samsung phone. Judge Koh has excused a juror who’s in IT who said she has a “personal dislike” for Apple. The juror said she’s been “personally burned” by Apple before, when it wouldn’t reimburse her for a defective computer that she spent a lot of money on. The last juror questioned individually said he doesn’t have a smartphone and he doesn’t like them, but he said he think he can be fair in this case. Judge Koh is keeping him in the jury pool for now. We’re down to 33 prospective jurors. Judge Koh excused a prospective juror who is a software engineer at Google after he said he used to go to church and have lunch with one of Apple’s witness. Samsung is upset. But Judge Koh said there are “many many reasons” to believe the men are friends. We’re down to 31 jurors. Multiple potential jurors have said they have close friends who work at Apple. But many of them say they can be impartial in Apple v. Samsung. Almost every prospective juror owns at least one Samsung product – usually a television – and nearly all of the jurors own multiple Apple products. Prospective jurors are giving their name, occupation, hobbies and relationship status. After two jurors said they were single with no kids, Judge Koh noted that she’s had two jurors get together after serving on a trial. Judge Koh asked the jurors to stay late today so they can finish jury selection. Opening arguments will happen sometime tomorrow. Samsung’s attorney Bill Price of Quinn Emanuel Urquhart & Sullivan LLP is asking jurors if they ever stood in line for an Apple product. Only one juror said she waited in line for 4 hrs for an iPhone, before she was told Apple ran out of it. Price asked potential jurors if they have a “gut feeling” that $24 million sounds too low for what Samsung should have to pay for infringing Apple’s patents. After one juror responded that it seemed low, Judge Koh told Price the question was inappropriate for voir dire. Just a note – it’s unclear how much Apple will be asking the jury to award in damages, but it’s likely in the hundreds of millions. Now we know Samsung will be arguing it should be closer to $24 million. My favorite thing about today is that the school bus driver made it onto the final jury panel. Morning! Here’s my recap on jury selection in Apple v. Samsung Part III. Opening arguments start in about an hour. There’s standing room only in Judge Koh’s courtroom. A lot of folks showed up to watch opening arguments. Judge Koh has wrapped up jury instructions. Each side is getting 45 minutes for opening arguments. First up is William F. Lee of WilmerHale for Apple. Lee tells jury Samsung made $3.3 billion in revenues from three of Apple’s design patents, and $1 billion in total profits, and that doesn’t include Samsung’s “willful active infringement ” of Apple’s two utility patents. Lee asks jurors to remember what cellphones looked like in 2006. When we think of cellphones we often think of devices that look like iPhones, he says. But before the iPhone, cellphones came in all kinds of shapes and sizes, with “a lot of buttons,” he says. Lee is describing each of the 5 patents at issue. Three are design patents covering visual features of smartphones like its icons, silver rim and glass front face. The other two are utility patents covering double-tap zoom feature and a scroll “bounce-back” feature. Lee says after the iPhone was released in 2007, Samsung lost half its smartphone market share and redesigned its phones to mimic the iPhone’s design. Lee says Samsung sold 18 smartphone models for 2 years, and kept infringing after Apple asked it to stop. “Design is what tied it all together,” he says. Lee announces Apple is asking the jurors to find that Samsung owes over $1 billion for infringing three design patents. “Is it a lot of money? It is sure,” he says. But putting it in context, Samsung sold millions and millions of infringing phones, he says. Apple only wants $5 million for Samsung’s infringement of its utility patents, since “these were not features that brought the phone together,” Lee says. 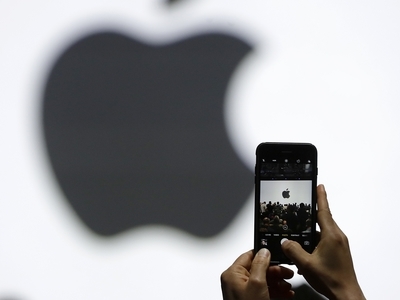 Apple’s opening arguments wrapped – Samsung’s up next! Quick recap: Apple wants Samsung to pay $1.005 BILLION for infringing its smartphone patents. Yesterday, Samsung’s attorney suggested it should only have to pay about $24 million. John B. Quinn of Quinn Emanuel Urquhart & Sullivan LLP is about to deliver opening arguments for Samsung. And I just caught a guy recording the jury walk in the courtroom with his cellphone. Not cool. Quinn holds up three pieces of an iPhone and tells the jury Samsung’s infringement is limited to those components. “Apple is certainly not entitled to profits on the whole phone as Apple would like you to believe,” he says. Judge Koh has made the jury leave the courtroom twice during Samsung’s opening argument. The first time was over Apple’s objection to Samsung referring to certain pre-2010 phone models. Now, Judge Koh is taking issue with Quinn’s reference to verdicts in other cases. She has asked to see Samsung’s opening statement and said she thought she prohibited either party from mentioning the findings in this trial. The jury’s not in the room. Judge Koh allowed Quinn to mention certain previous verdicts, but she warned both parties she doesn’t want to have to pause openings again to take up objections. “We can work this out now, so this is the only interruption,” she says. Judge Koh tells the attorneys she limited the number of slides they can use because in the first Apple v. Samsung trial, Samsung submitted 500 slides and Apple objected to them all. It created an incredible burden on the parties and the court, litigating 500 slides, she said. Quinn says Samsung’s smartphone market share jump in 2010 was caused by its switch to using Google’s Android operating system, its larger screens, its 4G capabilities and the fact that consumers could use any phone carrier and not just AT&T. 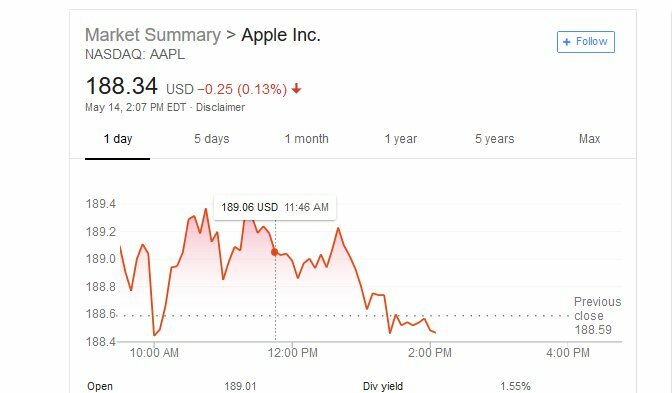 Quinn says Apple’s expert miscalculated damages by excluding certain costs and she should have only attributed the damages to specific components of the phones. Quinn says Samsung is only liable for $28 million for infringing three of Apple’s design patents, not over $1 billion. Quinn wrapped Samsung’s closings. Apple’s called its first witness: Greg Joswiak vice president of product marketing at Apple. Joswiak, who’s been with Apple for over 30 years, testified that Apple spent over a billion developing the iPhone, taking on risks by entering the cellphone market. “We really were betting the company,” he said. Joswiak said Apple would never sell is patented iPhone design components separately, just before trial recessed for an hour lunch. They’ll be back at 1:05. They’re back from lunch. Joswiak says Apple focused on marketing the iPhone as “the hero.” By the end of 2010, he said Samsung was Apple’s largest competitor and they thought Samsung ripped off its design. “We were pretty angry about it,” he said. On cross, Samsung’s attorney showed Joswiak a Samsung phone with a slider case and asked if Steve Jobs would “roll over in his grave” if Apple designed that phone. The jurors left the room for a quick break. A dispute between the attorneys came up over Samsung referencing patents that Apple wanted excluded from trial. Judge Koh seems irked. 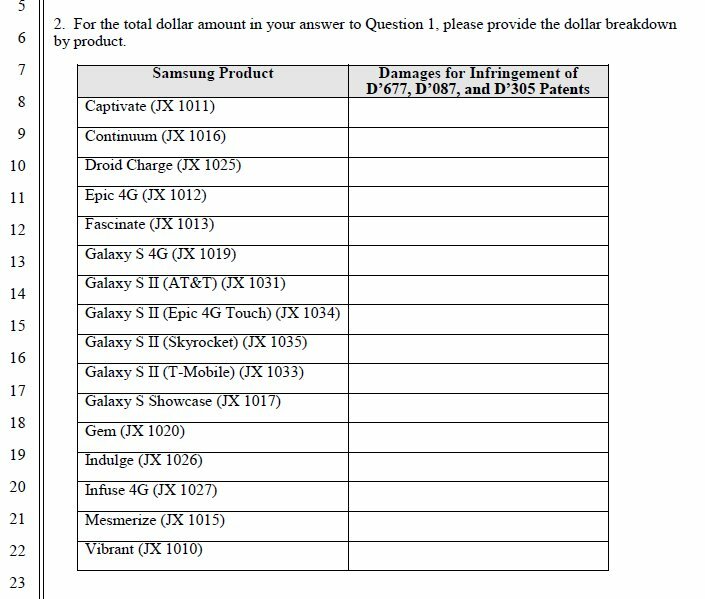 Judge Koh said Samsung submitted briefs with a “huge” list of patents, that she wants narrowed. “I don’t want any sandbagging – I don’t want any hide the ball,” she tells counsel. I’m taking a Twitter break to write, but I’ll be back at it tomorrow. Stay tuned – closings are expected for Friday, so this trial is super short. And we’re back! Day 3 of the 5 day Apple v. Samsung trial is about to kick off. The courtroom is still pretty full. We’re waiting on the jury. Judge Koh is back, and she says a juror was exposed to information last night. She’s being questioned. The juror says her husband turned on the TV this morning and heard on the news something about the Apple v. Samsung “billion-dollar case.” Her husband asked her if she was a juror in the case, but she says she turned around and walked out of the room. Neither party has an issue with keeping her on the jury. There are 8 jurors, but the judge notes they have a little cushion, and could go to 6 jurors if they need to. Apple’s case in chief has resumed with Apple’s expert Alan Ball testifying on how Apple’s black front-face design patent covers Samsung’s entire phones. “I think it’s very difficult to use the phone without seeing the screen,” he says. Ball says you can buy just about anything on the Internet, but that isn’t convincing evidence that Apple’s design patents are limited to certain components of Apple’s iPhones. Ball says Apple’s design patent covers the entire smartphone. He explained anything that gets put together can be taken apart, but you have to look at whether the product was intended to be taken apart. Samsung’s attorney Bill Price of Quinn Emanuel is now cross-examining Ball. He tells Ball he can’t legally start off by assuming the entire product is the article of manufacture. Ball says he doesn’t understand the question. Price is pushing Ball on whether one of Apple’s design patents covers the entire smartphone. Here’s a picture of the patent at issue (taken from the complaint). The patent covers the shaded area of the phone on the left. Ball says it does, based on a 4-factor test. There’s been an objection. Judge Koh made the jury take a break and the witness leave the room. Apple objected to Samsung showing a slide at trial with pictures of its non-infringing smartphone, which Apple says Judge Koh excluded. Judge Koh says Samsung’s counsel has made the demonstrative “on the fly” and is “sandbagging” Apple’s counsel. Judge Koh asked Samsung’s counsel to provide a list of new demonstratives they made “on the fly” so she could look them over together. But after Samsung’s attorney challenged her approach, she cut him off and said “let’s just do it in front of the jury.” She seems uh annoyed. Judge Koh explains she wanted to streamline Apple’s objections to Samsung’s new demonstratives by ruling on them all together. But “we’ll just do it every time” before the jury, she said. They’re taking a 10 minute break before the jury is back. We’re back. Ball takes the stand again, and Price is questioning him on whether there’s a prominent difference between Samsung’s non-infringing Galaxy Ace smartphone and its infringing Galaxy S i9000. Ball says he wasn’t asked to do an infringement analysis. The parties finished examining Ball for now. Next up is Apple’s expert Dr. Susan Kare, who’s a graphic designer. Kare designed the first icons and graphics in first Macintosh computers. She left Macintosh in 1986 with Steve Jobs, and since she’s designed thousands of icons for major tech companies, including Facebook and PayPal, she says. Kare says there is “no question” that Samsung’s smartphones use graphical interface described in Apple’s D’305 design patent. Here’s a picture of the patent she’s talking about next to Samsung’s smartphone interface. The jury just took an hour-long lunch break. After they left, Judge Koh told the attorneys to ask their clients if they would participate in an alternative dispute resolution proceeding after there’s a verdict. She said “maybe I’m wasting my breath,” but it’s worth a try. Back from lunch and Samsung’s counsel is examining Kare on Apple’s patent that describes its smartphone graphic user interface. He asks her if she thinks Apple owns the concept of having a colorful array of icons on a grid. She says she can only speak to what’s in Apple’s patent. The parties finished examining Kare for now. Apple has called U. of Toronto’s computer science professor Ravin Balakrishnan to testify on user interfaces. Balakrishnan testified on Apple’s utility patent covering a “bounce back” scroll feature, which he says Samsung’s phones use. Another U. of Toronto computer science professor Karan Singh is now on the stand, testifying in the other utility patent covering a tap and zoom feature. The parties finished with Singh and the jury just took a break. But Judge Koh told Samsung’s attys they had “invited nullification” of a prior verdict in their line of questioning. She’ll admonish them in front of the jury if they do it again. “It is very improper,” she says. CPA Julie Davis is now taking the stand to testify on how she reached the billion-dollar damages number, which she says Samsung owes Apple for patent infringement. Davis says there are 15.3 million Samsung smartphones that infringe Apple’s patents. Davis says Samsung made $6.3 billion in total revenue from selling 15.3 million smartphones that infringe all 5 of Apple’s design and utility patents. Of that, Samsung made $3.3 billion in revenues from phones that only infringe its 3 design patents. Davis says Samsung’s accounting spreadsheet with data on Samsung’s smartphones revenues changed by $1.3 billion after Samsung employees were deposed. “That was concerning to me,” she said. “If this information was coming directly out of Samsung one would think the numbers would be the same. but they weren’t,” Davis says. Davis says Samsung should have to pay a reasonable royalty rate of $2.02 per smartphone for infringing one of Apple’s utility patents, for a total of $5.325 million. The other utility patent-in-suit is covered by the total profit remedy, she says. Jury’s taking another quick break. Samsung’s counsel tells Judge Koh they plan to make an oral motion for judgment as a matter of law after Apple rests its case in chief, which should happen sometime tomorrow morning. Day 4 of the 5-day Apple v. Samsung trial just kicked off. Apple’s damages expert, Julie Davis, is being cross examined by Samsung’s counsel, Bill Price of Quinn Emanuel. Davis says she hasn’t calculated how much of Samsung’s profits would be attributed to portions of their smartphones. Price then wrapped with Davis and Apple has rested its case in chief. Samsung calls its first witness: Drew Blackard, Samsung’s senior director of product marketing. Blackard says Samsung increased the amount it spent on advertising its Galaxy smartphones from $25 million in 2009 to over $100 million in 2010. Blackard says in his experience consumers don’t buy phones based on their rounded corners, their glass screens or bezel, which are features covered by Apple’s design patents. Apple’s attorney William Lee of WilmerHale is now cross-examining him. Lee asks Blackard what Samsung’s revenues or market share would be for the bezels, glass-front faces and display screens of its smartphones. Blackard says he doesn’t know. Lee presses Blackard on whether Samsung’s attorneys gave him 3 parts of Apple’s smartphone on the same day he was asked to determine what constitutes an article of manufacture. Blackard says they did. The parties are done with Blackard for now. Samsung calls its next witness, Jin Soo Kim, who is testifying through an interpreter. Kim is one of Samsung’s principal industrial designers, who works on the exterior design of smartphones. Soo Kim says he was never instructed to copy Apple’s iPhone and was told by management if they focused on what the phone carriers say, the company would go bust. The jury took a quick break, but during it Apple’s counsel William Lee asked Judge Koh if they could bring up a jury finding of Samsung’s willful infringement during cross examination of Samsung’s witnesses. Lee argued Samsung’s counsel have repeatedly said some of its phones don’t infringe to “undermine” a prior jury’s infringement verdict. Lee said it’s prejudicial to Apple if they weren’t allowed to talk about the willfulness finding. Judge Koh said she needs to think about it. The parties finished examining Soo Kim. Samsung calls Dongwook Kim to the stand, a principal professional at Samsung who handles procurement activities related to product displays. He’s also testifying through an interpreter. Dongwook Kim testifies that Samsung keeps track of smartphone components, like their glass faces, and their individual prices. Apple’s counsel Nathan B. Sabri of Morrison & Foerster LLP is cross examining him on Samsung’s spreadsheets now. Sabri is asking Dongwook Kim whether Samsung sells infringing phone components or parts to consumers directly. Dongwook Kim replies that Samsung doesn’t sell them directly to consumers, but it sells them for service purposes like phone repairs. And that wraps his testimony. Samsung’s VP of Supplies and Logistics, Tim Sheppard, has taken the stand. He’s testifying on Samsung’s profits and losses between 2010 and 2011. Sheppard says Samsung Telecommunications America spent over a million per year on making glass faces to repair broken smartphones. He said the glass faces cost $3-4 dollars to make. Judge Koh called an hour-long lunch break. Jury left the courtroom, and the judge is asking Samsung’s counsel why they changed the witness list at 11:30 today while they were in trial. Samsung dropped 2 witnesses, saying they couldn’t stay in town. Judge Koh says she wants to see at least one of their plane tickets, boarding pass and time the ticket was purchased. The judge said she doesn’t think there’s a remedy, but wants to see if Samsung’s playing games. 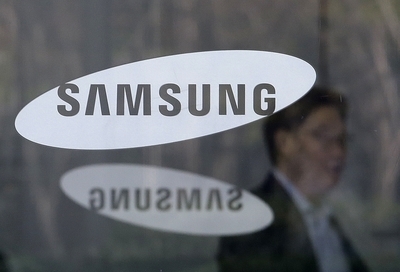 Judge Koh appears irked Samsung dropped witnesses in the middle of the Apple v. Samsung trial. “We can play these games if you think it is necessary for your case, which I guess you think you do,” but its “unfortunate,” she tells Samsung’s counsel. Apple’s counsel suggests Judge Koh gives Apple more time to argue, since they had alloted time to examine Samsung’s now-dropped witnesses, but she says she doesn’t think there’s a remedy. They’ll be back in an hour after lunch. Samsung’s two dropped witnesses: Samsung assistant manager of finance Kyuhyun Han and Samsung’s SVP, General Manager Justin Denison. Samsung says they left town. Judge Koh said she wants to see Denison’s boarding pass and the time he booked his ticket. We’re back from lunch. Judge Koh denied Apple’s request to mention Samsung’s willful infringement at trial. She says the probative value is low and the prejudicial value is high, so she’s not allowing it at this time. The jury’s back and Apple’s cross-examining Sheppard. And the parties wrapped quickly with Sheppard. Samsung has two witnesses left: user interface designer Sam Lucente and damages expert Michael Wagner. Lucente is taking the stand. Lucente says he visited Korea, took apart Samsung’s products and studied the “evolution of smartphones” to reach his conclusion that Apple’s 3 design patents are limited to the components of the smartphones and don’t cover the entire phone. Lucente says the typical smartphone is not “monolithic” and it exercises 200,000 patents. I’ve heard this statistic before – I’d love to know where it comes from. The parties finished examining Lucente. Samsung’s last witness, its damages expert Michael Wagner, is on the stand. He says he’s billed Samsung more than 8,000 hours since he started working on the case in 2011. Wagner says Apple’s expert miscalculated Samsung’s smartphone profits by excluding operation costs, like marketing, research and development. She said it’s around $1 billion, but Wagner says it’s actually about $370 million. Also, Samsung’s counsel plans to argue a motion for judgment as a matter of law this morning, without the jury present. That’ll take some time. They seem to be making the motion primarily to preserve the argument for appeal – very unlikely Judge Koh would grant it at this point. The jury’s back in the courtroom and Samsung’s damages expert, Michael Wagner, is on the stand. He’s Samsung’s last witness. Samsung finished direct. Apple’s counsel William Lee of WilmerHale is cross-examining Wagner on his testimony. Lee is pushing Wagner on his testimony. So far, he’s gotten Wagner to admit that the prior jury found Samsung’s smartphones, not the bezels and glass screens. infringed Apple’s patents. Lee also got Wagner to say since 2011 he has had a lot of difficulty getting information from his own client Samsung on a timely basis. 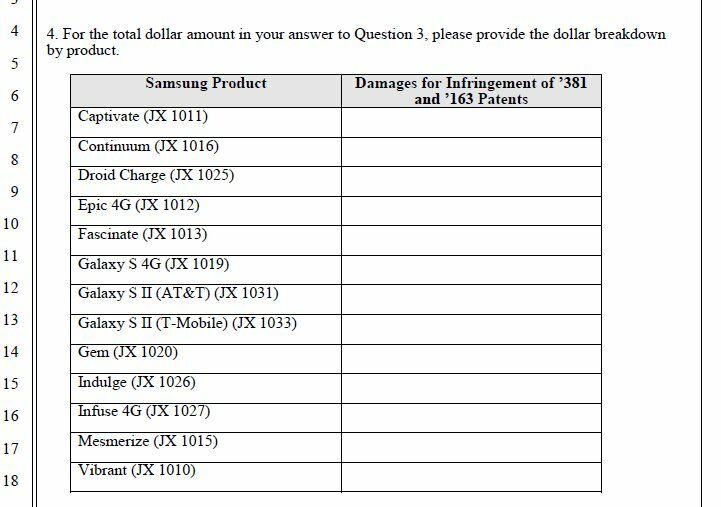 Wagner said he deducted all ~$270 million of Samsung’s R&D costs from its revenues but none of those expenses can be attributable to specific infringing smartphones. Same goes for Samsung’s marketing and administrative expenses. “I don’t have that level of detail,” he says. Lee asks Wagner if he thinks Apple should get nothing from Samsung for infringing 1 million infringing smartphones that resulted in hundreds of millions of dollars of revenue. Wagner agrees, saying Samsung didn’t make a profit on those models. On redirect now, Samsung’s counsel Bill Price of Quinn Emanuel asks Wagner about his billing rate and which damages expert gets paid more. Price gets Wagner to say that the prior jury found infringement, but never decided what constitutes an article of manufacture. Wagner also says it took him time to get data from Samsung because the data is highly confidential, and there were language issues. Wagner says Samsung pays him $795 per hour, and Apple’s damages expert Julie Davis charges $900 per hour. Wagner testified yesterday that he has worked over 8,000 hours on the case since 2011. So he’s made about **$6.36 million** by my tally. The parties finished with Wagner, and both parties have rested their case. Judge Koh says she needs some time to finalize jury instructions, so she let the jurors take a 15-minute break. The parties will have an hour each to present their closing arguments, which will start sometime after the lunch break. Judge Koh is now considering objections to jury instructions, which she’ll discuss after the break. Samsung’s counsel made one last stab at getting Judge Koh to change language in one of the factors in the 4-factor articles of manufacture test. Apple said the request is extremely prejudicial against Apple. After some argument, Judge Koh denied the request. The parties sorted out their jury instruction issues. Judge Koh is bringing in the jury to read them instructions before lunch, so they can hear closing arguments on a full stomach. Judge Koh finished reading jury instructions. She gave them a long lunch break. Closings arguments in Apple v. Samsung will begin at 1:45 p.m. PST. The jury left the courtroom. Judge Koh says the parties used almost all of their time during their cases in chief. Apple’s counsel had 28 minutes left and Samsung’s counsel had 34 minutes left. People are leaving for lunch but Judge Koh asked counsel to take back some of their hard copies of evidence. She says the courthouse has limited space and they’re “overflowing with binders” in the back. Closing arguments are about to start and the courtroom is full. William Lee and Joseph J. Mueller of WilmerHale are splitting closings for Apple. Meuller tells the jurors to use their common sense when thinking about why Samsung’s smartphone market share jumped in 2010. Meuller said 90 percent of the smartphones Samsung sold that year infringed Apple’s design patents. Meuller’s now pointing to jury instructions describing the four-factor article of manufacture test. He reminds jurors no one has decided what the AOM is. The jury has been told this at least a dozen times now by counsel and Judge Koh, if not more. Meuller says dotted lines in patent drawings are there to give context, and Samsung’s design expert Sam Lucente ignored that context. “You can’t do that,” Mueller says. Meuller says Samsung’s counsel tried to argue the differences between its noninfringing phones and infringing phones were minor. But that’s not the test, he says. What matters is if the claimed design is prominent in the product, he says. “The fact that you can pull apart a phone means nothing. It means absolutely nothing,” Meuller says. “The bottom line is a phone is a phone, and Samung has been trying to disassemble them this week, but they apply the designs to the phones,” Meuller says. Meuller says the jury shouldn’t deduct R&D and marketing costs, because Samsung didn’t identify those costs that are specific to the infringing phones. Meuller has wrapped with his argument. The parties are switching to Samsung’s closings. ITMT, Judge Koh just asked everyone in the gallery to make room so that the man who was sitting on the courtroom floor could sit on a bench. John B. Quinn of Quinn Emanuel kicks off Samsung’s closing arguments, saying it can sometimes be difficult to tell what’s covered by design patents and what isn’t. Quinn says unfortunately Samsung’s smartphones used Apple’s “very narrow” patented designs and points to the dotted lines in patent drawings. “These designs are narrow, because you’ve seen the non-infringing alternatives that are very very close,” Quinn says. “Focus on the language of the factor, not some of the spin that you’ve heard. Words here really matter,” Quinn tells jury. Quinn says it doesn’t even matter for the purposes of the case that Apple ever even made the iPhone. Apple would have been entitled to damages, if they had just owned the patents, he says. 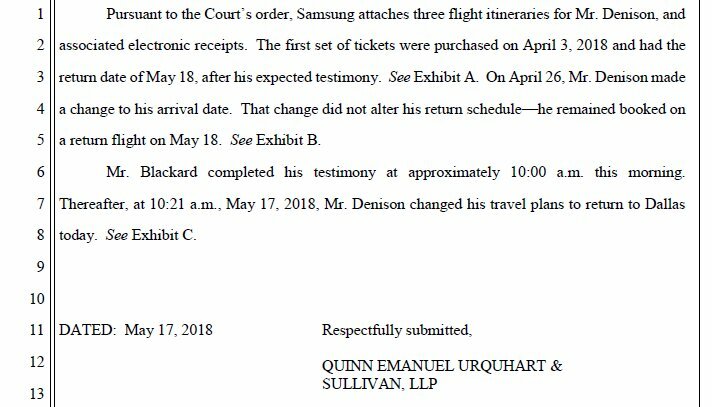 Quinn tells jurors Apple’s references to its alleged copying is “just intended to make you angry at Samsung, intended to make you want to punish Samsung.”Quinn is turning closings over to Bill Price of Quinn Emanuel, who will address damages. But Judge Koh let the jurors take a 10 minute break. Once Price wraps for Samsung, Apple will have 17 more minutes to argue and then it’ll go to the jury. Price tells jurors if they exclude Samsung’s expenses, “you’re awarding profits to Apple that aren’t profits at all,” because real money was spent on sales people, on accountants and on research and development. Price wraps Samsung’s closings and says he is turning it over to Apple’s Lee, who Price says “has a way with words.” Lee has 17 minutes. Lee tells the jury Samsung’s counsel have resorted to Apple and its experts, because the “law and facts are on our side.” Lee says Samsung has also repeatedly tried to undermine the previous infringement verdict. Lee says if VW’s Beetle is an article of manufacture, it’s not just limited to the shell of the car. And someone can take the Beetle’s shape to sell cars, just like Samsung took Apple’s shape to sell the phones, he says. Lee emphasizes that Samsung made $3.3 billion in revenues off of infringing smartphones. “If they’re allowed to keep all of that money there will be celebrations in the halls of Samsung, I guarantee you that,” he says. And Lee wrapped. Closings are done! Judge Koh is giving the jury a verdict form and telling the jury they can go deliberate until 4:30 p.m. PST – very unlikely they’ll decide a verdict in the next 25 minutes. Samsung will present its motion for judgment as a matter of law, which is mostly just to preserve the argument on appeal. I’m taking a break from Twitter, unless something comes up with the jury. Happy Friday! Jury is leaving, so there’s no verdict today. They’ll be back deliberating on Monday at 9. Happy Monday! I’m sitting outside Judge Koh’s courtroom waiting for a verdict to come down in Apple v. Samsung. Will the jury reach a verdict today? Verdict watch update: Just spotted a juror wandering around the courtroom hallway. They took a break and he got locked out of the jury room for um a while. It’s still pretty quite here outside Apple v. Samsung courtroom. The jury had a working lunch though – hopefully that means they want to get this decided today. Aside from the occasional pacing of fellow journos, it’s still quiet outside the Apple v. Samsung courtroom. Note to self: Bring more snacks tomorrow. OK, it’s official. Jury’s gone for the day. Back here tomorrow at 9 a.m. sharp for day 2 of deliberations in Apple v. Samsung. It’s day 2 of jury deliberations, and I’m back outside Judge Koh’s courtroom waiting for the Apple v. Samsung verdict to come down. Will they decide this today? Just in: the Apple v. Samsung jury has a question – people are heading into the courtroom. The jury is asking to see a slide that was shown during the direct examination of Samsung’s damages expert Michael Wagner. The slide showed a display assembly of a Samsung phone with a breakdown of the components that go into the display assembly, according to the jury note. Apple’s Joe Mueller of WilmerHale argues that Judge Koh shouldn’t give the jury the slide, since none of the demonstratives were admitted as evidence. Samsung notes the slide is of a picture that is in evidence. Mueller also repeatedly says Apple objects to identifying one exhibit in isolation, arguing it would give the jury the impression that the court is focusing on a particular piece of evidence. Judge Koh says she does think that’s problematic. Mueller tells Judge Koh at the last trial in 2013 the jury asked for a copy of a demonstrative and Judge Koh refused to direct the jury to evidence. Judge Koh says she wants to go back and take a look. Judge Koh is taking a short recess to review the record, but she notes that one of the jurors has a job interview this afternoon, so they’ll only be deliberating until 1:30 p.m. today. Judge Koh is back. She says the 2013 instance was distinguishable from this instance, because the jury had asked to see a slide from closing arguments. This is a different situation, because this is a factual piece of evidence that the jury is already focused on, Judge Koh says. Judge Koh suggests an instruction pointing to the exhibit, but also noting that all evidence must be heard. Apple still objects to the proposed instruction and asks that Judge Koh to also point to another jury instruction and exhibits. Samsung’s counsel says Apple’s suggestion is inappropriate and doesn’t address the jury’s question. Judge Koh is mulling it over. Judge Koh says she’s going to respond to the jury’s question the way she suggested, despite Apple’s objections. “The jurors are already focused on this issue,”… “we’re merely providing them a factual answer,” Judge Koh says. Judge Koh adds that there are “many many boxes” of exhibits in this case, so it would be helpful to just give the jurors a factual response to their question. And the court’s in recess until TBD. And another day of deliberations has gone by and there’s still no verdict in Apple v. Samsung. I’ll be back here tomorrow at 9 a.m. Hoping the third day’s the charm! Waiting for a verdict to come down can be painfully boring. But luckily there are other journalists outside the courtroom to talk with about the finer things in life. Journo: I ate lunch for dinner last night. Me: I ate half a pizza. I’m back sitting outside Judge Koh’s courtroom, waiting for a jury to decide Apple v. Samsung. Will the third day of deliberations be the charm? There’s another jury note in Apple v. Samsung. Everyone’s heading into the courtroom. And here’s the note from the Apple v. Samsung jury. Judge Koh is in the middle of hearing her criminal calendar, so while counsel for both Apple and Samsung are in the courtroom. It’s going to take a few before we get a response to the question. Judge Koh is currently drilling an attorney on why the personal property of a prisoner who died in prison 4 months ago was never returned to his wife. Reminder that Apple v. Samsung isn’t the only case on Judge Koh’s docket. Correction – Judge Koh is in the middle of hearing her civil calendar, not criminal. Even so, it’s still gonna take a few before she addresses the jury’s question. And Apple v. Samsung is up! Judge Koh says first off, the jury numbered the note as note number 5, even though it’s the 2nd note they’ve received. She also says she doesn’t think they can answer the jury’s question. Apple’s Joe Mueller of WilmerHale agrees with the judge. 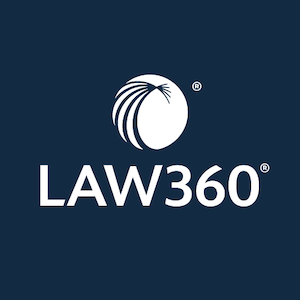 Samsung’s counsel Victoria Maroulis of Quinn Emaunel disagrees and suggests they refer the jury to certain sentences in the jury instructions. Apple objects to that idea. Judge Koh rejects Samsung’s suggestion. She says she doesn’t think it’s appropriate to emphasize one jury instruction or explain what configuration means. Samsung says, for the record, they object. “Understood,” Judge Koh replies. Judge Koh sent the jury a note saying she can’t respond to their question, but they have their instructions. The court is in recess again until TBD. No one really expected the Apple v. Samsung jury to deliberate past today, including Judge Koh. The question we’re all asking now: Is there going to be a mistrial? Well, my train to San Jose was cancelled this morning (of all days!) so I will be an hour late to Apple v. Samsung. But the judge required both sides to appear at 9 a.m. – today should be lively! After a light sprint, I finally made it to the courthouse. I’m outside Judge Koh’s courtroom now. Judge Koh sealed it and is talking to counsel for both sides. Stay tuned! Counsel for both sides just filed out of Judge Koh’s courtroom. Neither side is commenting. The jury is back to deliberating, and no one knows what all of the hubbub was about. The jury has told Judge Koh they’re “ready to return” to the courtroom. Not sure if that means we have a verdict. In any case, I’m here in the courtroom waiting for counsel for both sides. Apple’s counsel is back. Now we’re just waiting on Samsung’s team. Wondering if we’ve got a verdict or a mistrial on our hands. John Quinn for Samung just walked into the courtroom. He’s sitting alone at Samsung’s table, waiting on the rest of his team. And the rest of Samsung’s team is filing into the courtroom. Judge Koh should be coming in soon. Judge Koh is back. She says she doesn’t know if the jury has a verdict, all they did was say they are ready to come back to the courtroom. They might have a verdict, but she said she wants to be sure there are no errors. She’s calling them into the courtroom. The jury’s back and they have a unanimous verdict. The foreperson is the Barnes and Noble store manager, btw. She’s handing the verdict form over. Samsung owes $533,316,606 for infringing Apple’s three design patents, jury finds. Samsung owes Apple $5,325,050 for infringing the two utility patents. Judge Koh asked counsel for both sides to double check the jury’s calculations, which both teams are doing now. Apple finished checking the numbers, but Samsung is still number crunching. The parties finished checking the jury’s calculations. Judge Koh is back. Apple’s Joe Mueller of WilmerHale says there is “tiny and inconsequential issue” in the numbers, which he says are a dollar or two off. Samsung’s John Quinn of Quinn Emanuel says “we’ll give them the dollar,” but has no issues at the moment with excusing the jury. Judge Koh said she wants to know what Samsung’s issue with the verdict is, and she says she’s open to sending additional instructions back to the jury to reconsider their verdict. We have a jury that we think can correct any inconsistency, she says. Samsung’s John Quinn says they don’t think the verdict is supported by the evidence on what is the article of manufacture is. But he says they’re comfortable addressing it in post-trial motions. He’s not waiving inconsistency arguments, Quinn says. Judge Koh says if there is any curative instruction that needs to happen she wants to do it now. Quinn repeats that he thinks the jury should be excused and they’re comfortable pursuing their challenges to the verdict in post-trial motions. Judge Koh says ok, and brings the jury back in to discharge them. Judge Koh discharged the jury, and she’s now setting post-trial hearing dates. Reminding us all that the fun doesn’t stop here! Samsung is likely going to appeal basically all of it. Apple’s counsel says they need to talk with the client about whether they will file post-trial motions. If they do it will likely be in regards to supplemental damages – unsure how much Apple would be seeking. “I’m not going to do a calculation of damages until I know this is a verdict that is going to be affirmed and going to be valid,” Judge Koh says. Judge Koh asks the parties again if they would be open to alternative dispute resolution – ie. settlement talk. Both parties said they are open to it. Woooow. Judge Koh said if they want the settlement talks to be confidential, that’s fine, but she wants it to happen within 30 days and she wants updates. Judge Koh also unsealed the transcript from this morning’s sealed session. One of us reporters is gonna have to go digging through transcript records to find out what the heck caused all the hubbub this morning. And that’s a wrap! Court is adjourned. A sole juror is rehashing the rationale behind their decision. She says they determined that one patent design was the whole phone because you need the phone to see it and another patent covered parts of it including the internal circuitry. Juror says the 4-factor test was challenging because you have to look at the patent and there were various words in the patent that had many meanings. The juror is a 26 year old technical writer who collaborates closely with designers, engineers and she says design dictates “so much,” even in writing. Juror is telling samsung’s counsel John Quinn of Quinn Emanuel next time to have translators reiterate the questions after their answer, because it was confusing. Juror says they spent most of their time arguing over the d’677 patent. For the 305 patent they found the Aom was the entire phone and the d677 patent covered parts. She says she was the sole juror disagreeing with the others today and yesterday. Juror says Apple was kind of like the good cop and Samsung was kind of like the bad cop. Juror says she didn’t think about the financials or about punishing Samsung and they all agreed pretty quickly that the d’305 covered the whole phone bc can’t see the design without the phone. Another juror, the Barnes and noble manager, is chatting outside about their reasoning. And she finished chatting. That’s all folks! It’s a dog’s world and we’re just living in it.